I took a statistics course in University many years ago. One of the many exercises we did was to take a series of data points and manipulate it to get different results. Using various approaches to compiling and analyzing data points, results could be easily skewed to support a PRO or AGAINST position on just about any topic related to the information. Of course, politicians are masters at this game; there is always some study whose results support the latest item on their political agenda. As we’re in the throes of a provincial election campaign – and a federal election is on the horizon – we’re inundated with all sorts of numbers and much of it doesn’t make a lot of sense, regardless of your supporting position. No wonder Mark Twain penned the title of this article. 47 municipalities in North America were reportedly hit with a Cyber Attack. Many go unreported. One in five Canadian businesses experienced a Cyber Attack. Per-capita, Canada became the 3rd highest country affected by Cyber Attacks – up 103% in 2018, when compared to 2017. Globally, there were 10.5 BILLION Cyber Attacks in 2018 – and 3.9 TRILLION intrusion attempts. PDF and Word file attachments were the most prevalent attack vectors. Alarming, Scary, Depressing – pick your reaction; it doesn’t matter. There is no positive spin to put on these statistics. One fact remains: no one is immune to Cyber Security Threats. The REAL risk is ignoring these threats and falling prey to an attack. Hardware and Monitoring, including deploying an Enterprise-Class Firewall, using best-of-class Anti-Virus, and employing Active Security Monitoring. Backups and Disaster Recovery, including effective Local, Offsite & Cloud Backups, Action Plans to mitigate the effects of an attack, and Backup and Disaster Policies that are followed. User Education and Policies, including keeping up-to-date, Preventative measures in the event of an attack, and understandable Cyber Security Policies. Your Reputation will be tarnished, including a loss of confidence in ALL of your actions, possible investigation by authorities, and ramifications from loss of private information. There will ALWAYS be a Financial Loss, including lost productivity, ransom payment, IT recovery services, new IT hardware, and lawsuits. At TRINUS, we’ve been recommending and employing these Cyber Security counter-measures since 2014. But we still encounter clients who ignore the threats and live a high-risk IT lifestyle. I can tell you that one attendee at the conference approached us afterwards with a short but sad story of how they fell victim to a ransomware attack last December. Of course, they were completely on-board with our message. We wish they hadn’t needed that real-world wake-up call. So, what’s it going to take to ensure you don’t become part of the 2019 Cyber Security statistics? 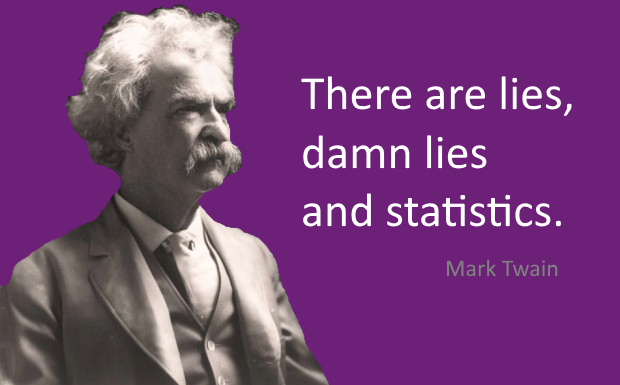 Are you going to pull a Mark Twain; putting the statistics down to a Damn Lie – and carry on without adequate protection? Given the available counter-measures and education available, there’s no reason to be caught in a Cyber Attack. If you need more information on effective Cyber Protection, please contact me or your Account Manager for stress-free Cyber Security.